← A Whippet ? …….or……..a Greyhound ?………………..
……….will fit into a 2 inch square painting ? In this instance, 4. Could have squeezed a couple more in, but Llamas might get a bit “spitty” if cramped ! Winsor & Newton Pro Watercolours on a 2″ square of Bockingford. 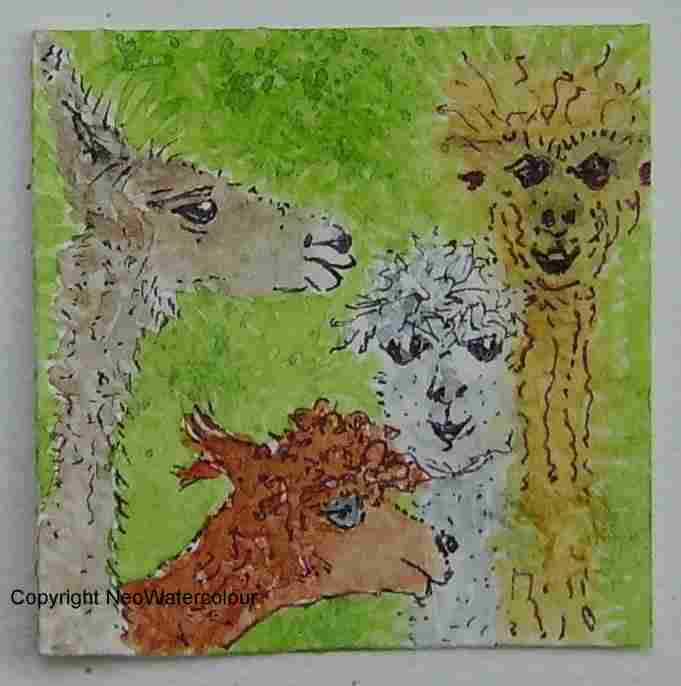 This entry was posted in Derbyshire - watercolours, Sheffield - watercolours and tagged Alpacas Llamas Ringinglow, Bockingford, Llamas, Mayfield Alpacas, Sheffield Llama Alpaca Farm, Watercolour Alpaca Llama, Winsor & Newton. Bookmark the permalink. 1 Response to How Many Llamas……..